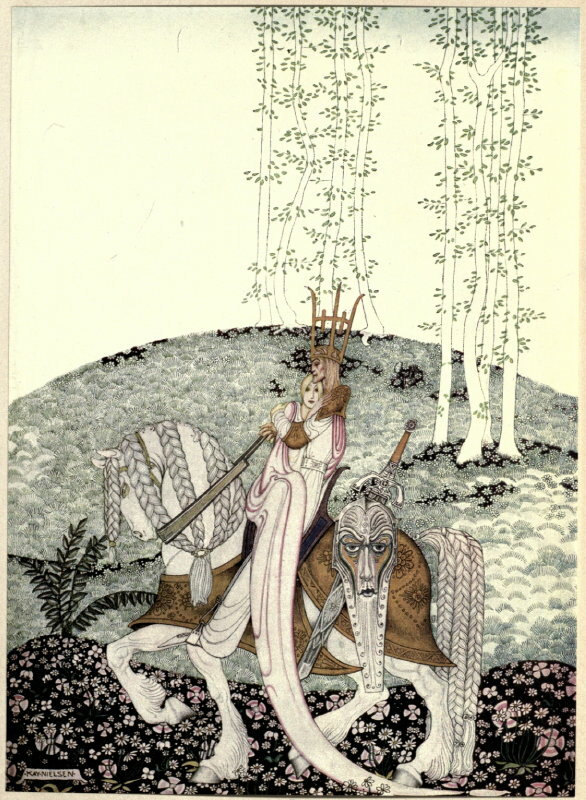 Lady Shirishanu, rare concubine to Lathanon, the last of the Incadescent Kings, was known to have been composing a book of verse in her final years. The work is said to have been unfinished at the time of her death. It is thought that she extracted a promise from the King to destroy it, since it was not ready for the world. Some say that when she died Lathanon burned it, others that he carried it with him when he went to the heavens below. But some say that he could not bear to destroy it, and, breaking his oath, had it bound and placed within her cenotaph. What it contains, even its title, is unknown. From time to time a false copy turns up in Zyan above, but it has always been seen for what it is, an “unfinished” poem by a second rate hack. 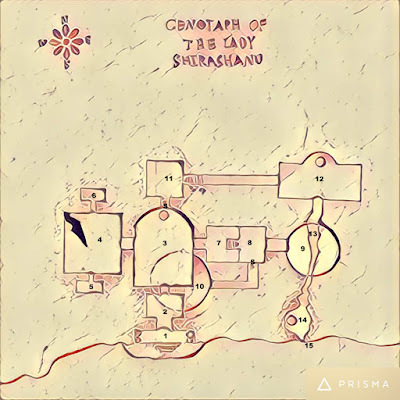 The sole copy is, as some have surmised, to be found in the cenotaph of Lady Shirishanu (see area 9). 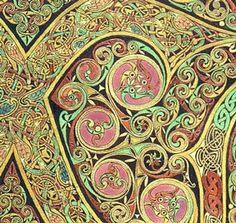 The book is bound in boards covered in the pearlescent leather of some antique beast. The heavy pages are stitched with lustrous silver thread. Opening the boards, the frontispiece is a dense illumination of an impossibly intricate mechanical device. The text of the poem is written in an elegant looping script, in dark yellow ink that has aged to a burnt orange in places. The poem appears to be incomplete, judging from two features. The first are the spaces left, presumably for illustrations to be inserted at a later time. The second is the fact that the story of the poem appears to break off before its end. Curiously, a number of blank pages have been bound into the end of the book after the poem breaks off. The character must choose a suitable art at which she will henceforth excel in a distinctive and personal style. From this time forward, she must create or she will wither like a songbird shut in a lightless box. If she is unable to practice her art for 1 month she will fall into despair, receiving -2 on all rolls. The character raises her charisma by 1 permanently for the striking impression that her heightened fancy has on others. 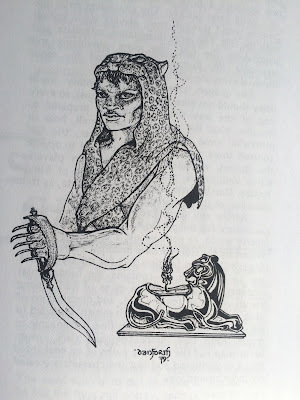 At 8th level her fancy becomes so potent that she may cast 1 1st level illusionist spell per day, to be chosen at the start of the day from the entire list; at 11th level she may cast 1 2nd level spell; at 14th level she may cast 1 3rd level spell. These are direct manifestations of her heightened fancy, and not spells in the academic sense. However, this heightened fancy leaves her vulnerable to mind affecting spells and illusions. Starting at 8th level she permanently saves against them at -4. If the book is transcribed, although still a recognizable work of great genius, the poem will not produce this effect on readers. For it is the physical text that is a vessel of the Lady's fancy. 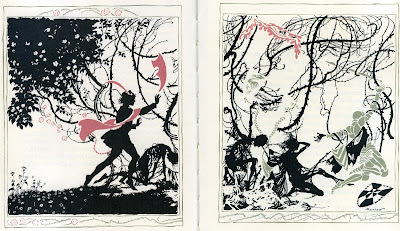 The protagonist of the poem is Holaxes, a rogue and lover. The poem begins with his murder at the hands of a romantic rival, and follows him to the hinterlands, a purgatory at the border of the lands of the living and the dead. It tells how Holaxes dwelt for one night there, wandering alone in a reverie through leafless woods, under the strange light of the necromantic moon. This gibbering moon of the dead is said in the poem to cast a light of a hue unknown to the living, and to whisper secret songs heard only by those who have lost all hope irrevocably. Just as the moon is setting, and the thin light of wretched dawn first breaks over the bleak woods of the hinterlands, Holaxes is snatched back to life through the powerful sorcery of the lover who inspired his murder. The poem tells us that Holaxes found himself ever after with a strange hunger to lay his living eyes once again on the light of that moon of the dead. Try what he might, the promptings of this appetite would not be denied. 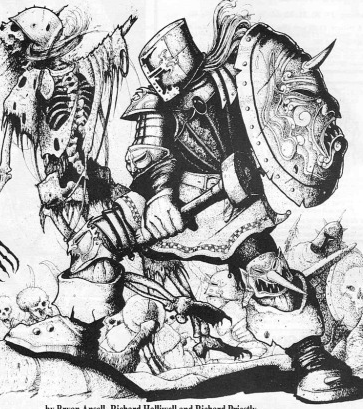 The poem follows his attempt to penetrate a dread prison called the Abyssal Dungeon, where a portion of the necromantic moon shines in the world of the living, sapping the life and vigor of any who would penetrate the terrible cell it illuminates. To seek the necessary implements for his doomed quest, Holaxes travels to the White Jungle. 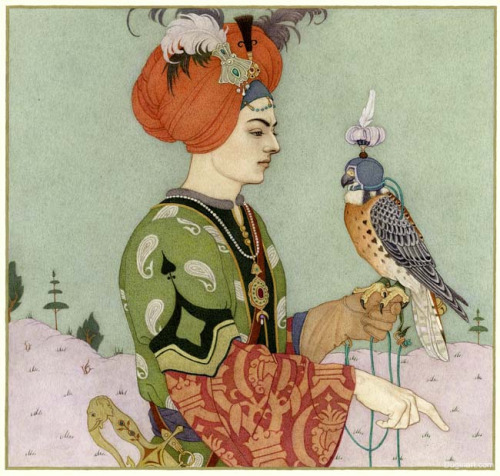 During this jungle interlude, he steals by cunning the effulgent sapphire of Marikozazz, one of the Sultans of the air. 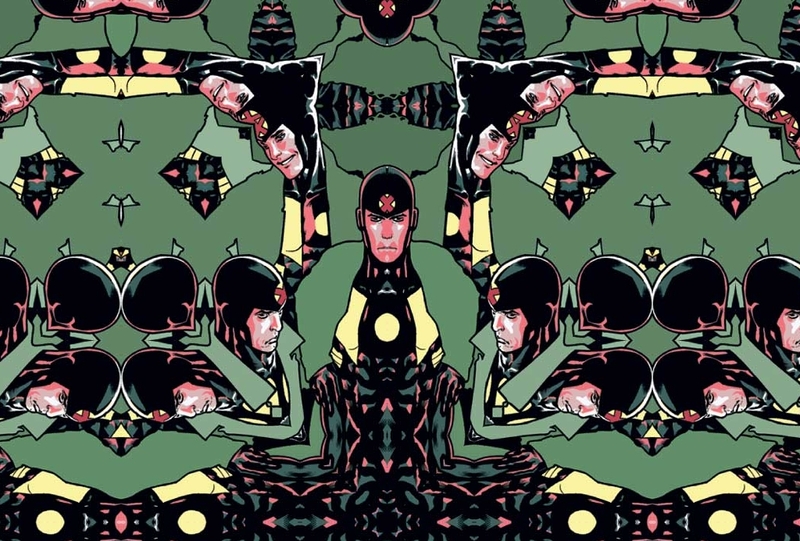 From the were-panthers, he acquires a mutable tool called the Flexible Vistrum, a living golden fiber that inhabits the inner substance of his body. 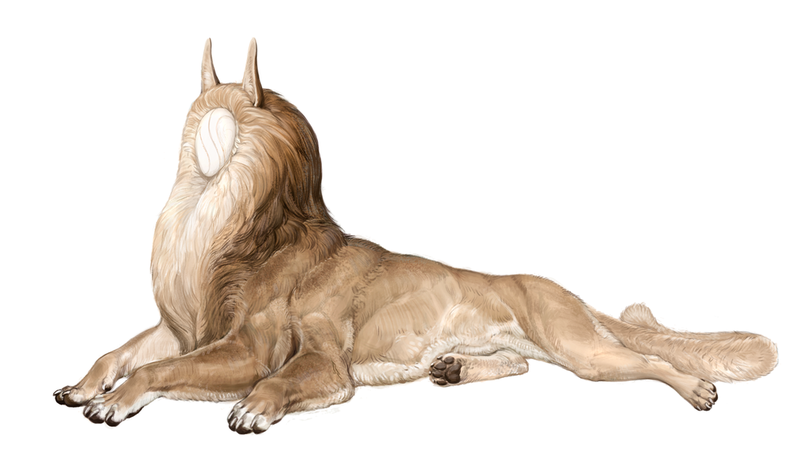 Holaxes wins his steadfast companion too, the shapeshifter Inithi, in a game of dice with the panther priests. Having acquired the needed aid, Holaxes travels to the dungeon. 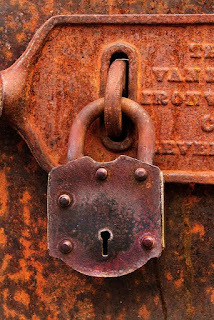 The first is a simple lock, unadorned, and rusted, set in a common looking tarnished metal door, as one might find covering a cellar door in a back alley abattoir or whorehouse of Zyan. Its smell is unpleasant, reeking of petty desperation and forgotten squalor. The lock, although difficult to open owing to decay of the mechanism, is by no means a challenge for Holaxes' experienced hands. But it is only the first of many. Behind this first unassuming door stands a second of polished dark wood inlaid with lapis lazuli. It is the door one might have found to the once gleaming pleasure towers of Zyan, behind which topaz fountains sparkled and peacocks strutted. The lock on this door is magnificent and complex, as though to say smugly, "The world that lies behind this door is not for such as you." Behind this gilded door lies a great machine, into the aperture of which Holaxes must enter physically, twisting through claustrophobic spaces to spring the massive tumblers and rotate the bewildering interlocking gears that roll and mash together alarmingly. 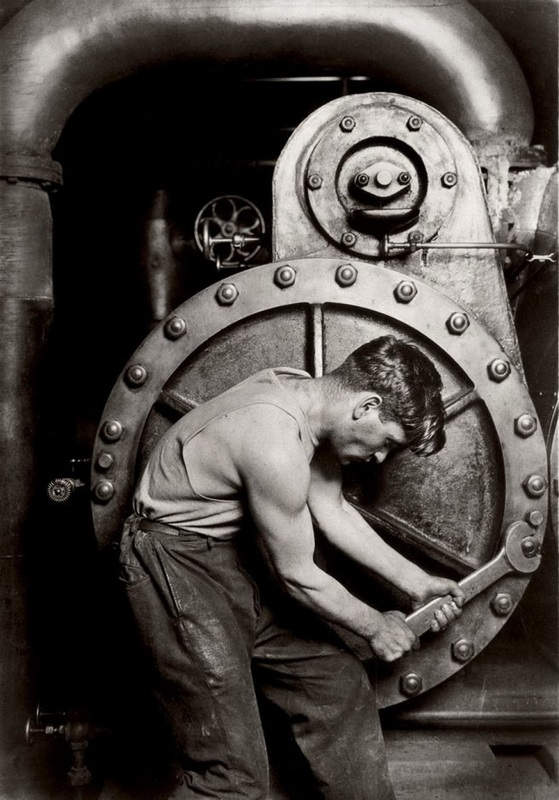 The poem suggests something inhuman in the ingenuity of this mechanical portal. It as though it lays the knowledge of man before one in graphic and monumental form, but shows it thereby to be indifferent to man's purposes and inimical to his welfare. Beyond the Hydraulic Portal, the fourth lock is visible only through an intricate series of prisms and mirrors. This disorienting prison is sprung not by physical contact, but through the clever manipulation of reflections. Here the poem itself becomes refracted into mirrored reflecting pieces, the whole revealed in the part and the part in the whole, like a series of nesting and echoing surfaces, each containing illusory depth. 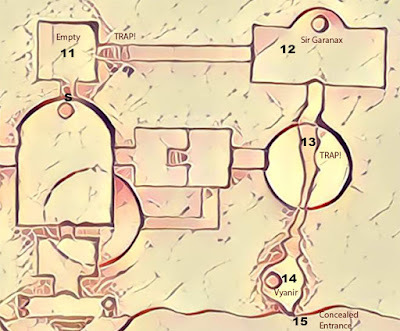 Beyond the disorienting surfaces of the Optick Prison, lies an empty room. 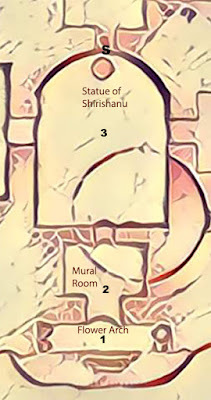 Drawing on the inner sight of the panther priests, Inithi reveals to Holaxes that the fifth lock is not in the room, but on the astral plane in the corresponding location. Employing an ancient ritual learned from his captors, Inithi transports them there. The Penumbral Knot appears in the form of entangled silver skeins. Holaxes must separate them to reveal the mercurial sphincter that leads beyond. These skeins are the densely intertwined fates of the eldest scions of the twelve noble houses of Zyan. 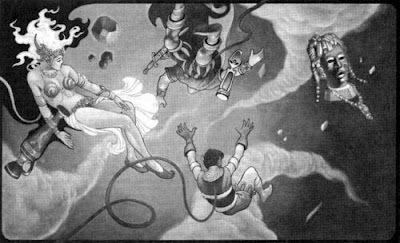 Holaxes untangles the silver cords while Inithi defends him from the soul-eaters that stalk that misty void. The masterful overlapping narrations of the entwined fates of the scions is interspersed with scenes from this desperate battle. 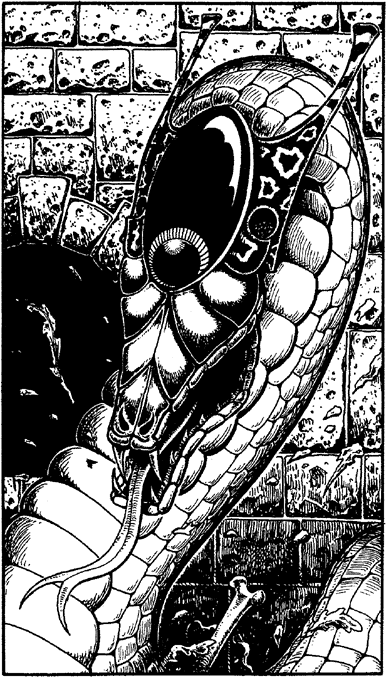 Through the mercurial sphincter, Holaxes arrives at a fragment of a green door that is sealed with only half of a lock. As Holaxes has heard from his sorcerer lover, one half of the Cloven Barrier was frozen at the time of its creation, and has remained three centuries in the past, while the other half has traveled forward through time to the present. Holaxes must span his time and the year of the the founding of Zyan to spring the Cloven Barrier entire. For this purpose he employs the potent refractions of the effulgent sapphire of Marikazzaz that separates its owner into temporal parts. The portions of the poem that take place in the past are written in the archaic language of the early epic poets. 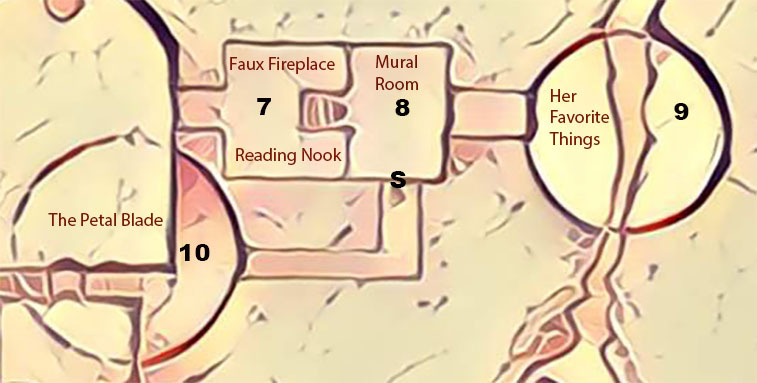 Beyond the united halves of the Cloven Barrier, lies a simple room with only a small jeweled box resting on a pedestal. This box contains a virulent speck encased in a translucent lozenge. The only way to open this final seal is to ingest the lozenge and release the cancerous puzzle that spreads throughout ones organism. In his greatest and daring feat, Holaxes must unlock this final portal by employing the Flexible Vistrim to turn the inner springs of his own organism into tools to solve this fatal puzzle. 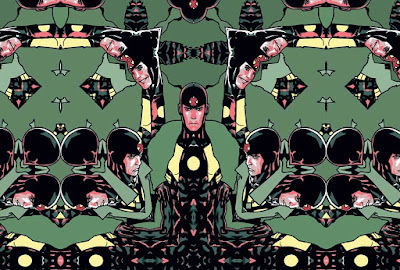 As this metamorphic cypher spreads through his body, the poem breaks off suddenly. It is not known whether what the poem describes exists in reality. If it does, those who have read the poem know that there are two possible explanations for this. Sober minds will naturally conclude that Shirishanu learned of whatever element of truth the poem contains through her voracious reading in the legendary library of the Summer Palace, supplemented perhaps by her daring experiences in the White Jungle and beyond. But, those who have absorbed into their soul a piece of the great spirit animating this work, will know instinctively that a less sober possibility is no less likely: that reality has bent its knee to the might of her potent fancy, so that it might finally assume the form of living poetry. From the pagodas of the hanging merchants, follow the bridge that descends through the black chasm, winding between the trunks of the massive trees. At the bottom, you will see a footpath of handholds and little bridges leads into the dense interconnected thickets of brambles that spring from the massive trunks. Travel through the thickets northwest, and in a day's time you will reach Mount Vanothoe. Its red slopes descend from the rock of Zyan above into the depths of the jungle below. Circle Mount Vanothoe for another day, and on its far side, you will eventually come to an ancient funerary shrine to Lady Shirishanu, the remarkable concubine to Lathanon, last of the Incandescent Kings. The shrine was erected in the twilight of the Incandescent Kings, in the last of the halcyon days before the two crowns were separated, and Zyan began its descent into ruin. When the Lady Shirishanu died, they say the grief of the king was all consuming. He would have erected a fitting cenotaph to her graceful personage in the sunny gardens of the Summer Palace that dangles in the lush bowers of the jungle below. But the queen would not hear of it. In her jealousy, she forced him to build it in the rank and lightless precincts of the brambles above. 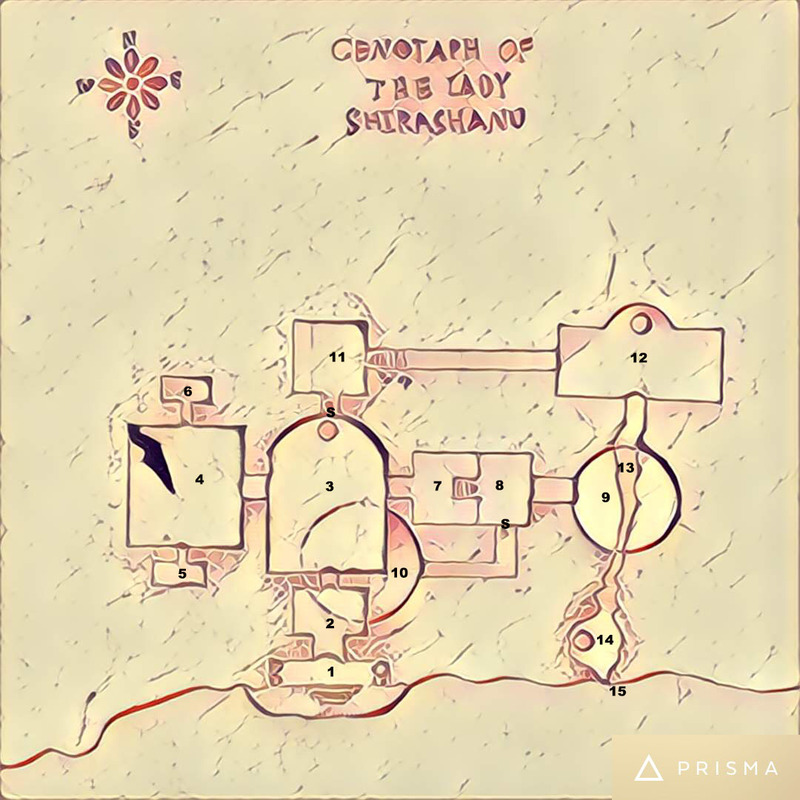 Shirishanu's corpse is not to be found there; as befit a noblewoman, it plummeted through the endless Azure Sea to its resting place in the heavens below. But Lathanon is said to have filled the shrine with lavish tomb decorations, and Shirishanu's singular possessions. Guarding it with fierce magics, he left it a fitting monument to her memory. Should you have troubled to ask among the hanging merchants, they will have told you that the tomb is likely unspoiled by the hands of man. For the bold travelers in the latter days were all members of the Guild of Explorers, and Lady Shirishanu is sacred to them, being venerated in one of their more prominent hero cults. And within a generation, all exploration of the white jungle ceased. The cenotaph is carved directly into the living rock of Mount Vanothoe. The brambles end some 20’ from the rock-face here. The ropes supporting a once elegant wooden bridge have rotted through. The bridge dangles down from the natural rock ledge of the entrance. A series of steps leading up to an entryway are carved into the living rock. At the top, past four elaborately carved columns, a white marble archway enters into the darkness. On the floor of the arch, rotting flower petals are scattered. The rock-face to the right and left of the entrance is completely covered in snaky vines that obscure the mountainside beneath it, descending from ledges high above. These, along with an illusion, conceal an alternative cave entrance to the east, (see area 15) 30’ up the cliff side. The climb is difficult, the vines are brittle and provide no support. Only someone climbing up the eastern face will find the hidden entrance. Note that beyond the arch, within cenotaph, there are no wandering monster checks. Everything within the cenotaph is unnaturally still and quiet. Beyond the pillars, an 8’ high and 12’ wide carved marble arch extends 5’ into a passageway that leads deeper in. The arch is white with golden veins and is covered in marble work depicting curling vines and blossoming flowers. On the ground is scattered a pile of rotting flower petals, once white and red, now mostly brown. Beyond the arch the passageway opens quickly into a small room, with another arch leading out the opposite way. Some sort of stone figure is set back to the left. A thief who searches for traps here successfully without entering the arch will get a bad feeling about the heads of the carved flowers. If anything passes through the arch, it will trigger the heads of flowers to flip, revealing transparent crystals. Beams of sunlight will stream from them, striking anything that passes through. Those struck must save vs. spells or be transformed irrevocably into a pile of flower petals that swirls elegantly in the wind before settling into a pile on the floor of the arch. 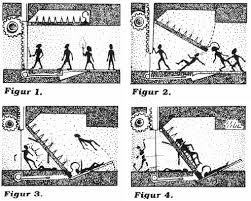 Those running through the arch may roll 4d6 below their dex to avoid the beams. Furthermore, there is a slight beat between beam firings as the mechanism resets. Those triggering the trap and availing themselves of this delay, may subtract one die, rolling 3d6 below their dex. Magical darkness will deactivate the trap for the duration of the spell. Dispel magic will deactivate the turn for 1d6 turns. The crystals and arch are impervious to ordinary blows. Lady Shirishanu, although your body rests in the heavens below, may your name be preserved in the song of the Sibilant Maiden, which holds at bay the devourers, until its last note is sung. This spacious nave leads up to a statue of a woman, carved from the purest marble. She rests reclining on a divan and looks up at the viewer with a sad and knowing expression. One hand rests languorously on the hilt of a long and elegant sword, also carved of marble. Its scabbard is decorated with swirling forms, and its hand-guard looks like the petals of a great flower. The craftsmanship of the statue is astounding; so graceful is this woman’s form, and so noble her countenance that the viewer will find tears coming to his eyes in the still sadness of this room, and find himself aching to see her move and to speak with her. Other furniture, divans, couches, chairs made of fine a dark wood like cherry, with sumptuous cushions, are arrayed around the statue of the woman, as though inviting you to join her in her sojourn in the garden. The furniture is valuable (1000 GP total, but very heavy). One smaller chair (150 GP) and two especially fine cushions (50 GP each) are easily moveable. There is a smell of decay and death in this room. A large altar composed of a smooth gray material that glitters in torchlight lies against the west wall. A huge rent runs through the floor coming from the northwest corner of the room, passing just in front of the altar. Somehow torchlight does nothing to illuminate its black recesses. 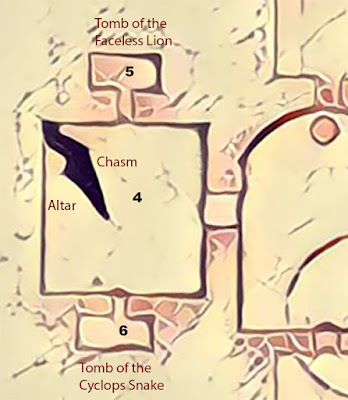 The northern end of the altar, near the chasm, has been bored through, revealing a hollow interior where a cache of six translucent eggs rests. Braziers (75 GP each) stand at each corner of the altar. The ceiling is covered in a mural depicting the heavens below. The dark chasm is the lair of an insectile horror that oozes a metaphysical darkness. It infiltrated the tomb when the shifting of Mount Vanothoe opened the rent in the floor. There is a 50% chance it is in the fissure springing out at an opportune moment and surprising on 1-4. 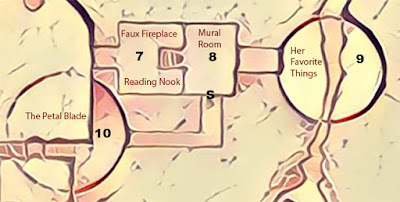 For each turn the PCs are in areas 4, 5, or 6, there is a cumulative 25% chance that the Carver will return to the fissure. In combat, the Carver will center its darkness on itself to bewilder opponents and then emerge to drag them one by one into the fissure. (It will always focus its attacks on a single victim at a time.) 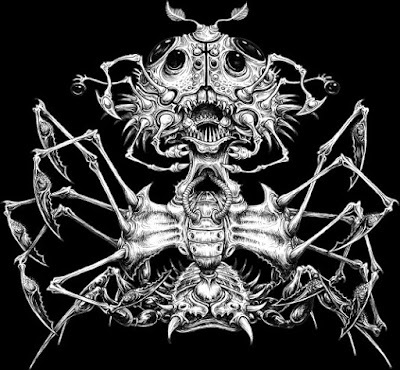 If the darkness is magically dispelled, it will reveal itself as a hideous white insect, with a twisting thorax and numerous bladed appendages. HD4 (24) AC3 MR:6 Att:3 Slices 1d6/1d6/1d6 if it strikes with two blades it can drag an opponent (4d6 under strength) or darkness 15’ radius (2x per day). Its lair is a cramped natural cave 15' in from the rent in the floor. The half devoured corpses of strange jungle beasts litter the floor. There is an opening to a claustrophobic series of natural caves that lead to the root maze at the bottom of Mount Vanothoe, where it hunts. This small room is almost complete taken up by a plain 7’ by 3’ box composed of the same gray glittering material as the altar. The lid is surprising light for what looks like stone. Within the box is a wooden sarcophagus with handles, painted with the likeness of some kind of leonine figure, the face of which seems to be smudged out with white. To open the sarcophagus one must unhook a latch that has a poison trap, save or die with purple blisters bubbling up and bursting within minutes. Within is the perfectly preserved body of the Faceless Lion that served as lady Shirishanu’s pet. It wears a golden collar studded with tiny opals (250 GP). Its hide reeks of preservant, but nonetheless will fetch a considerable sum (500 GP). This small room is almost complete taken up by a plain 7’ by 3’ box composed of the same grey glittering material as the altar. The lid is surprising light for what looks like stone. Underneath the lid, a pair scythed blades are coiled on springs, and will sweep out in a circular motion if the lid is lifted doing 1d12 damage to all with a 5’ radius. Within there is a sarcophagus painted with the image of a one-eyed snake. 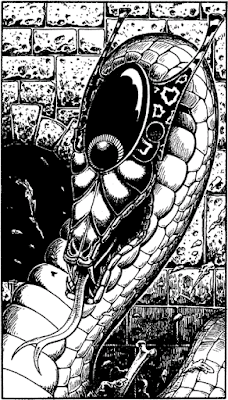 Opening the sarcophagus reveals the corpse of the Cyclops Snake that was lady Shirishanu’s companion. Its single jeweled eye is worth 500 GP for alchemical purposes, and its skin will fetch an additional 250 GP. On the north side of this room, there is a faux fireplace, richly carved. On the south side there is a reading nook, with a comfortable (and heavy) chair. On a small plain table several books of antique poetry with gilt spines, favorites of the Lady, are stacked. They are The Song of Ilagesh (100 GP), Meanderings in the Jade Garden (100 GP), and the now quite rare Impossible Verses (200 GP). This large circular room has a domed ceiling, coming to an apex 20’ up. 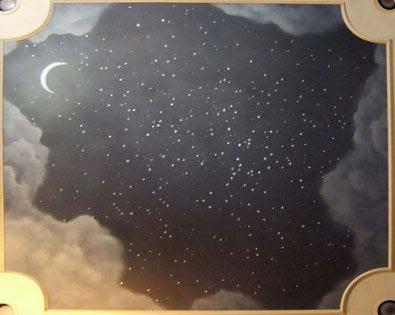 It is decorated with an image of the heavens above. Constellations unknown to the waking world can be seen, as well as the bright moon that emits a silvery glow. Glass cases stand to the north and south on marble columns at chest height. To the east there is a similar case on a raised dias, with four steps leading up to it. The case to the north is a bell jar that unfolds like the flowers of a petal when touched. It containing a long lock of the of white hair, resting on an illuminated parchment with an inscription in silver ink, “When we met you gave me a lock of your lustrous hair. Take mine as proof positive that I will join you when my time comes to travel to the heavens below.” The case to the south is a large glass box that evaporates when touched. With rests a gorgeous instrument carved of a strange white wood, with silver strings, long and sinuous (1000 GP). The circle of moonlight that bathes the pedestal is a magical trap. Any ordinary item that enters the circle will be stained a silvery white. Anyone stepping within the circle of moonlight, or touching one of these infected items, must save vs. spells or become a tentacled white beast for 24 hours hungers ravenously for flesh and will attack living creatures relentlessly. The light may be occluded if something is extended upwards to block the beam, but anything that touches the beam will turn a silvery white in one round. On the second round, the contagion will flow 10' down the object towards the hands that are holding it. When objects are removed from the light they will return to normal. Moon Beast: HD6 AC3 Att: Tentacles/Tentacle 1d12 Morale:12 MV12. As soon as the PCs step into the room, a form will suddenly appear on the divan, rising to address them. She has the white hair of the Zyanese and piercing golden eyes. Her cheeks are tattooed with faces from scalp to chin so that it appears almost as though she wears a three-faced mask. She will introduce herself as Laluria, the Handmaiden to Lady Shirishanu. She will inform the party that she bound herself to guard even in death the Lady’s most precious possession from falling into unworthy hands. She will issue a challenge to the group to choose their most able fighter to face her in a duel to the death. Should she slay their champion, they must leave the Petal Blade at once and never return. Should they triumph, she will return finally to pass through the gates of Ushanpoor, the Brass City of the Dead, having fulfilled her oath. She is a member of the Guild of Horoscops, a sixth level monk who fights with weirding ways. Laloria Monk 6 S10 D15 C16 I12 W13 Ch10 HP25 AC4 Att:1d12. She gets 3 attacks every 2 rounds MR:12 MV:180 If she hits by more than 5 she stuns her opponents for 1d6 rounds and has a % chance of instantly killing him equal to his (descending) AC. If she is attacked, or subjected to hostile spells, by anyone other than the party's selected champion, she will spring an identical double to face each new assailant. This effect holds for the doubles as well, should they be attacked by a new assailant. Note, however, that only one double can be produced for each additional assailant. So if a member of the party has already produced a double, he may attack any or all of the doubles without additional effect. (There can be at most as many Lalorias as there are members of the party.) Laloria will not pursue someone who fights honorably but then flees, although she will taunt them. However, should she be caused to double, or should someone steal the Petal Blade while she fights, then she will pursue the tomb robbers throughout the Cenotaph. This 30x30 room has decorative columns in the corner. The molding is decorated with the heraldry of Saint Garanax, a white rose with a golden stem, and the flashing lightning over a lake—paint and goldleaf over plaster. 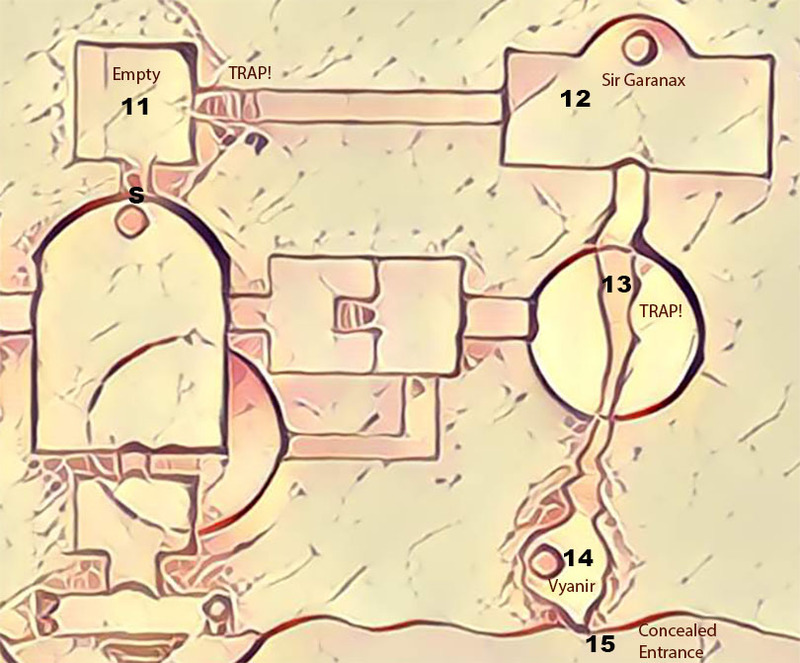 There is a pit trap on the third and fourth stair—an illusion covers a 20’ drop into enormous razors set into the floor roll 5d6 under dex or take 3d6 damage. 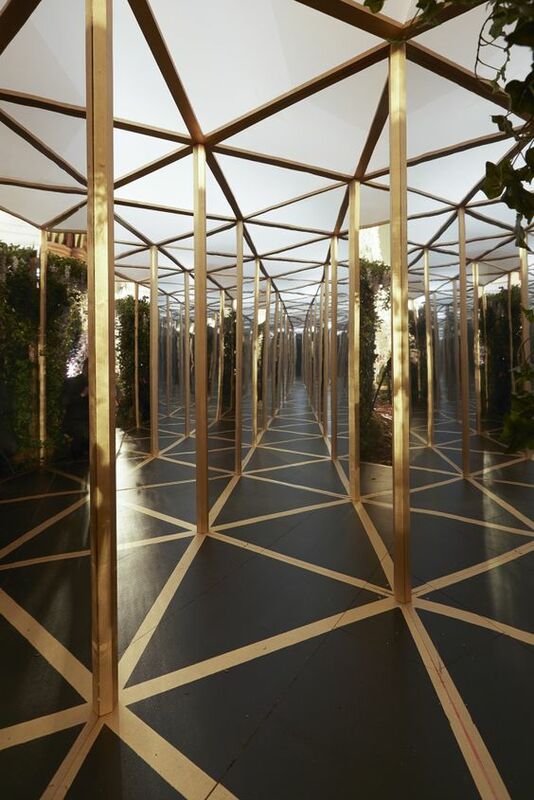 This 100’ long natural tunnel has an unusually smooth floor and walls that glistens in torchlight as though polished. In the center of the passageway, there is a 20’ pressure plate that is triggered by 30 Lbs or more weight. When it is depressed, a pair of blade springs from the floor, sweeping the corridor on tracks running at 2 ft and 4ft heights, beginning at the northern end and disappearing into the floor at the southern end end. They do 6d6 damage if they strike, save vs. breath weapon for half. (Those crawling on their bellies avoid them.) The next round after the blades run by, nozzles in the ceiling will descend, spraying acid over the length of the corridor to clear it of any remains. 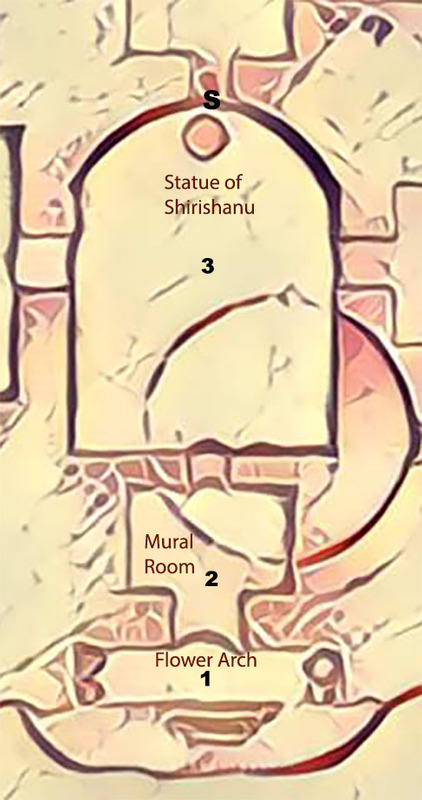 Those still in the corridor must roll 4d6 under dex to clear the space before the spray begins. Those caught within take 3d6 damage. If not immediately scraped from the person, it does an additional 1d6 per round for 3 rounds. Careful examination of the floor or walls will show it to be covered in some kind of impervious resin. 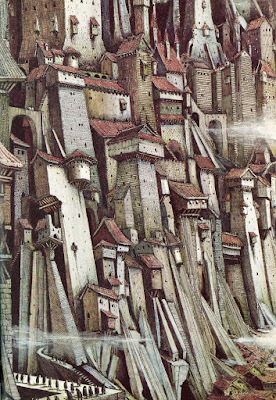 The tracks, although cleverly concealed, will be visible to anyone meticulously examining the walls of the passage. The nozzles above will only be visible if the 12' ceiling is examined closely with a light source. The entrance here is 70’ east and 30’ up. It is concealed, both by the hanging vines and by an illusion that makes it appear as natural rock. The Petal Blade is a long and thin sword. 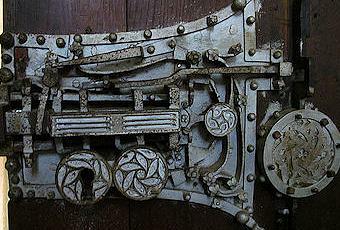 It sits in a white metal scabbard bearing flowing abstract designs chased in platinum. The hand guard of the sword is shaped as the petals of a flower, painted in white enamel with a warm inner glow. When the sword is drawn from its scabbard, the sound is of wind rustling reeds in late summer. The blade shines like polished silver, but is hard and sharp. It does not hack or batter, but slips past armor, seeking out the recesses, the hidden vulnerabilities, where the blood can be released from the soft flesh that conceals it. It is an intelligent weapon driven by a romantic sense of honor and whimsical humor. It hates emissaries of the Hidden King and seeks crafty vengeance against them. Although desires and emotions flow from it into its wielder, it rarely asserts its will in a direct fashion. The Petal Blade is +2/+4 vs. agents of the Hidden King. Its intelligence is 16 and ego is 12.